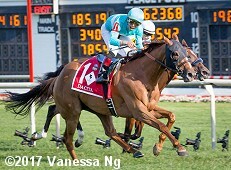 Owner Sol Kumin leads Dacita to the winner's circle after the 2017 Beverly D.
The distaff counterpart to the Arlington Million is the $600,000 Beverly D Stakes (G1). 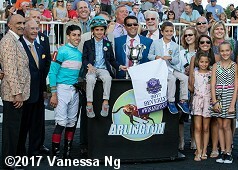 A field of 10 older fillies and mares contested this 1 3/16 mile trip over the firm Arlington turf course on Saturday looking for automatic entry in the Breeders' Cup Filly and Mare Turf (G1) under the Breeders' Cup Challenge Series "Win and You're In" promotion. 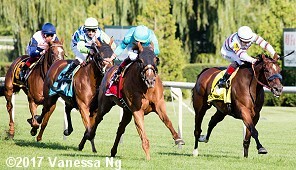 Mint Julep Handicap (G3) and Modesty Handicap (G3) winner Dona Bruja was sent off as the 2-1 favorite. 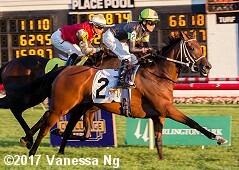 In to challenge her included 3-1 second choice Grand Jete, winner of the Eatontown (G3), and 5-1 third choice Hawksmoor, off wins in the Beaugay (G3) and New York Stakes (G2). Jockey Frankie Dettori sent 19-1 Zipessa to the lead first time by and she set fractions of 23.84, 49.34, and 1:14.81 over the firm going while pressd by 6-1 Rain Goddess and stalked by Hawksmoor. Entering the stretch Zipessa tired as Hawksmoor gained a short lead through 1 mile in 1:38.11 but she soon gave way as well. Favorite Dona Bruja, 7th early under Declan Cannon, came out 3 wide into the lane and led at the 1/16 pole but Irad Ortiz Jr., 8th early aboard 7-1 Dacita, came out 4 wide to prevail by 1/2 a length in 1:55.49. Grand Jete, 6th early under Joel Rosario, rallied to finish 2nd in a dead heat with Dona Bruja. 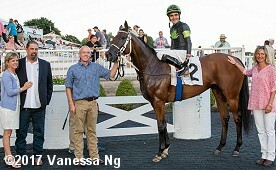 Left: Dacita in the winner's circle. 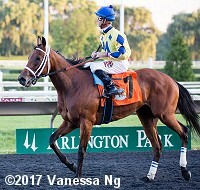 Winning owner Sol Kumin said, "We were waiting for her to be right and praying for some firm ground and we got it today and got super lucky. This filly is something special, the way she finished we knew she had it in her. Thanks to Mr. Brown. 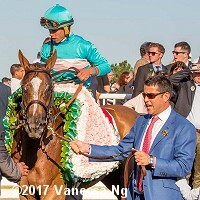 We'll have to regroup and talk to Chad (Brown) with the Breeders' Cup being the goal." Right: Trophy presentation for the Beverly D.
Left: Dacita in the post parade. Winning jockey Irad Ortiz Jr. said. "First I want to thank the owner for giving me the opportunity. I got a perfect trip, I got the one hole and broke out of there and got close I didn't want to be too far. I saved all the ground and she was there for me." 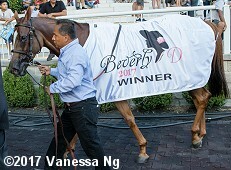 Right: Dacita heads back to the barn after the race in her new winner's blanket. 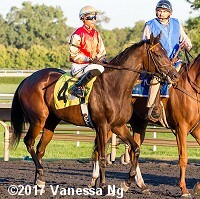 Left: Second place finisher (in a dead heat) and beaten favorite Dona Bruja returns after the race. Jockey Declan Cannon said, "She didn't start as good as she normally does, she dragged me around for six furlongs and did a little more than she normally does. In the stretch she gave me a little kick, but it wasn't what she normally can do but I think she tired herself out fighting me." 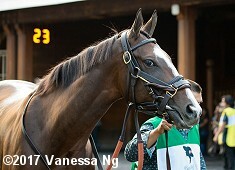 Right: Second place finisher (in a dead heat) Grand Jete in the paddock. Jockey Joel Rosario said, "I was trying to save ground. Turning for home I had to wait a little bit longer than I wanted but she ran good." 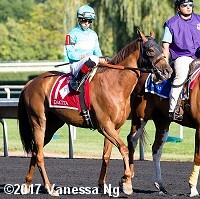 The last race on the card was the $100,000 Pucker Up Stakes (G3) for three-year-old fillies going 1 1/8 miles on the inner half of the turf course. 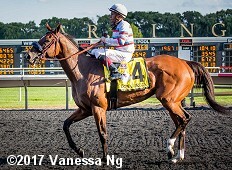 Boiling Springs Stakes winner Lipstick City was the 3-1 favorite in the field of 12 over 7-2 Journey Home, 8th in the Belmont Oaks Invitational (G1), and 4-1 Sensitive, an allowance winner last out. 95-1 Royalty Princess was quickest away through fractions of 22.99, 49.04, and 1:13.80 while pressed by 94-1 Katinka and stalked by 50-1 Princess La Quinta. Entering the lane the pacesetters tired as Journey Home gained a short lead through 1 mile in 1:38.83. 12-1 Fault, 6th early under Miguel Mena, came out 4 wide for the drive to win by a neck in 1:50.08. It was another 2 3/4 length back to 5-1 Lovely Bernadette third. Winning trainer Michelle Lovell, celebrating her first graded stakes win, said, "She's just maturing and she keeps getting better. We'll take it one step at a time from here." Left: Second place finisher Journey Home in the post parade. Jockey Jose Ortiz said, "He broke well and got into a good position. At about the half-mile she worked her way out and I tried to follow�[Canny]. I went a little wide but was second-best." Right: Third place finisher Lovely Bernadette in the post parade.